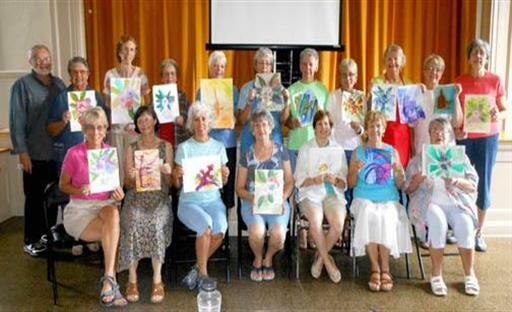 RAKUN painting workshops are designed for groups of up to 30 participants. All discussion material and images for the painting exercises are projected on a large screen for easy viewing by larger audiences. The workshops are highly interactive, with lots of Q&A and open discussion. Each workshop focuses on a particular subject, such as how to paint clouds, or trees, or reflections on water. CLICK HERE for a list of available workshops. Please contact Troy to discuss how your organization or business may host a Rakun Art Workshop. Painters above attended one of the 25 painting workshops (each on a diferent topic) presented by Troy from 2011 through 2017 for the Fluvanna (county) Art Association, near Charlottesville, Va. This workshop focused on learning to paint more freely, moving toward more semi-abstract work.. Troy's a great teacher - basics and beyond: M.J.
II think dedicated teachers are few and far between and I'm very glad to find that I have found such a dedicated one" S. R.
“Good info, great fun” W. P.
" I'm not so scared of painting clouds now. Thank you so much! M.K. "Thanks for all that you have taught us and inspired us" Mildred. S.
"Great analysis of cloud structure, especially the info about perspective and reflected light from the land below - things most artists miss." K.L. For info and participant comments on my workshops and classes, please click the green ART or MUSIC buttons above.